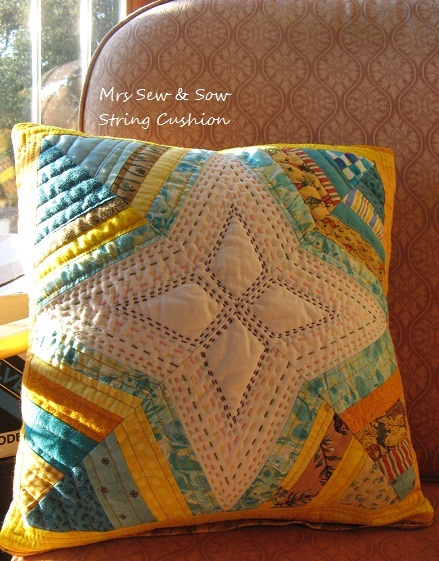 I received this cushion in the Brit Quilt Swap from the lovely Jeanette aka Hobbylass - ok you know that already! Jeanette's cushion totally inspired this one as I realised how great the texture of FMQ looks in a cushion - and it is a manageable size to practice on but a bit bigger than the sample squares I have been doing! 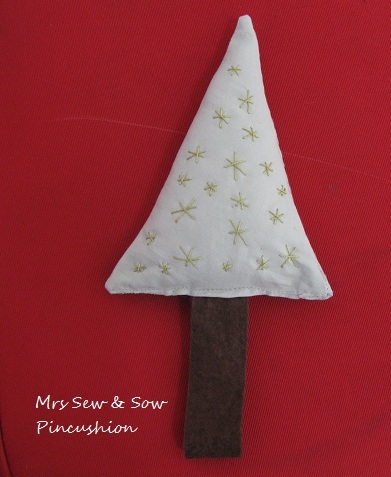 Here they are together - oh I know they don't co-ordinate in colour but they do in texture! 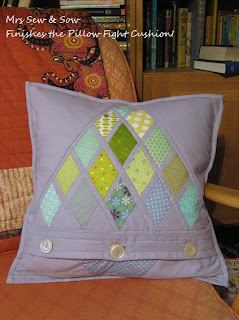 The other side of my cushion uses up two orphan blocks that I made in 2007 so that is another UFO crossed off my list! Hurrah! 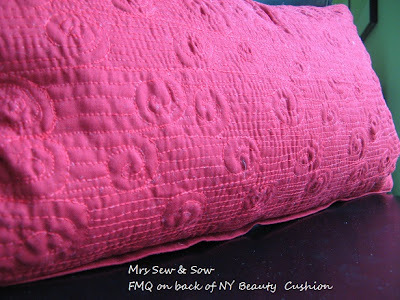 So thanks Jeanette for the cushion but also for the inspiration - I just needed that idea of a bigger surface to FMQ on! 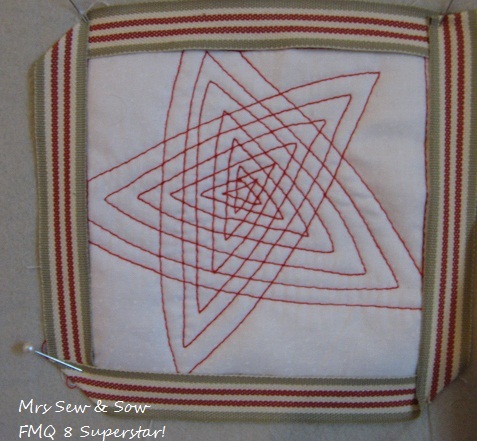 There will be no stopping me now - why not FMQ on placemats, tote bags, purses, runners!? Well you can see where I am headed and all because of Jeanette's cushion! I have fallen behind with making Bee Blessed blocks! 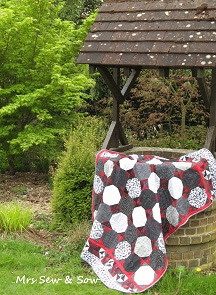 I am supposed to send blocks to the lovely Judith at Rags to Bags and she makes them up into quilts with the help of a few friends and other virtual bee members. These quilts are then gifted to people in her community. Here are my overdue Log Cabin blocks for November. These are destined for some more elderly recipients hence the traditional colours and floral fabrics. 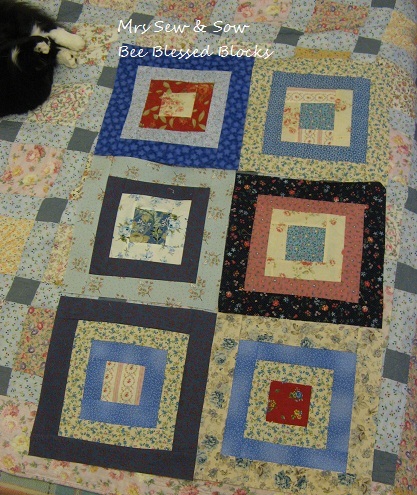 These blocks are disappearing into the quilt on the bed which has a traditional feel to it too. Note black fluffy blob in top left hand corner - Saffy's usual daytime sleeping position - only thing missing is my latop which she likes to keep warm beside! Think that is her head and three paws! She does keep me company for which I am very grateful now that everyone is at school/work! If you would like to help I am sure Judith would be overjoyed to have more willing volunteers to make blocks, or even gift some material! 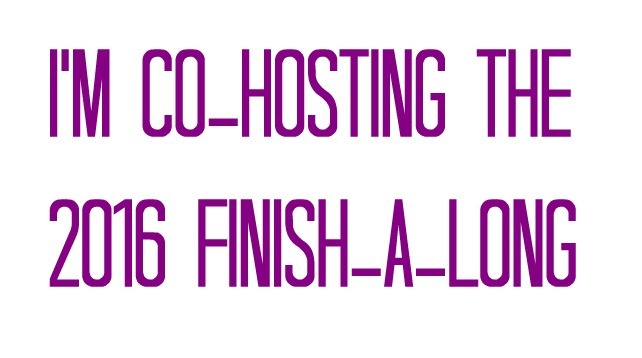 It is all going to a good cause and what better use to put our hobby to than helping others feel a little bit special? The Flickr group can be found here! It feels like making fabric! It truly does! 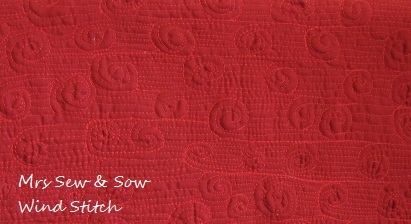 And here is the fabric I feel I have created by adding texture through Free Motion Quilting on my little machine! 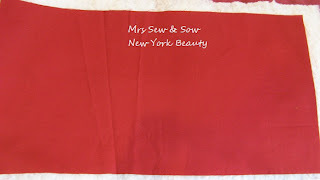 It started out as a piece of solid Kona Ruby red fabric yesterday. 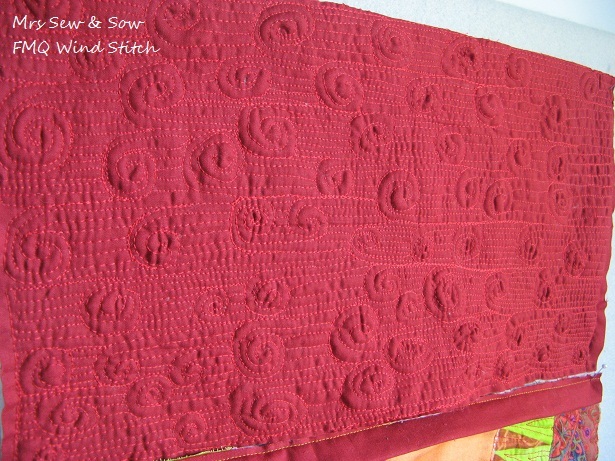 I was using a pattern from Leah Day's Free Motion Quilting Programme and actually it is one of the intermediate/advanced pattern's called Wind stitch. 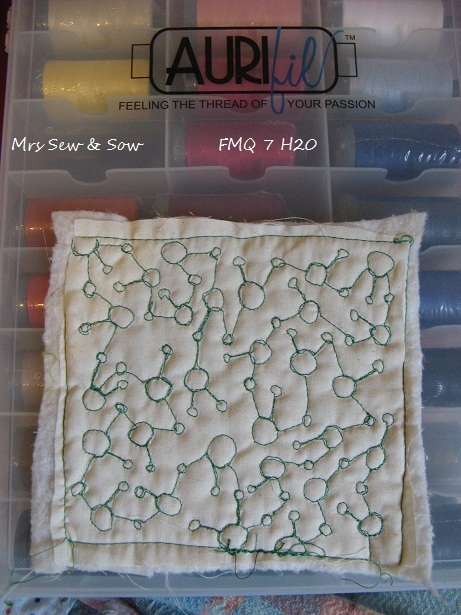 It is not perfect but I am keen to break free from my little sample squares and unleash my FMQ on my work - I think it is the only way I am going to improve! 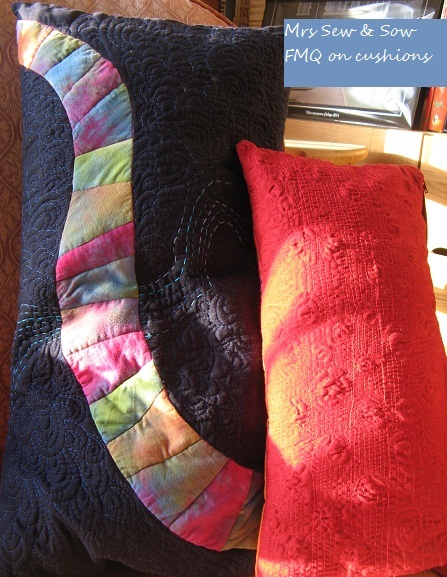 Now I have the two quilted sides of my next cushion and all I have to do is buy a zip on Monday which will match the red and then the cushion can be put together and finished. Another UFO shot down! Bang! Ah that will feel great ! 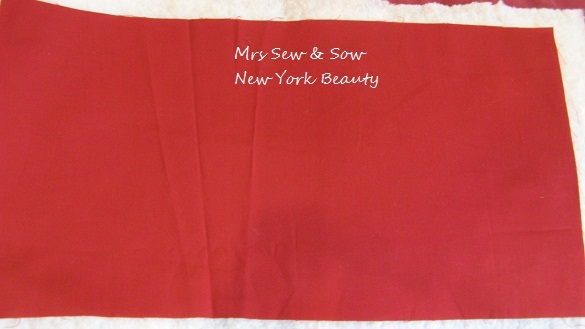 Way back in November 2007 I was on a workshop learning how to paper/foundation piece the New York Beauty block. I only got as far as making two blocks and have got no further since. 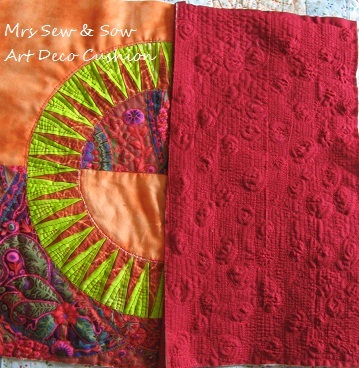 I am again using Aurifil 28 to quilt this cushion but this time in a lip smacking red colour 2250. Love it so far and I am trying to bring out the Art Deco feel of the block - a period of decoration I love for it's very graphic and almost modern feel. 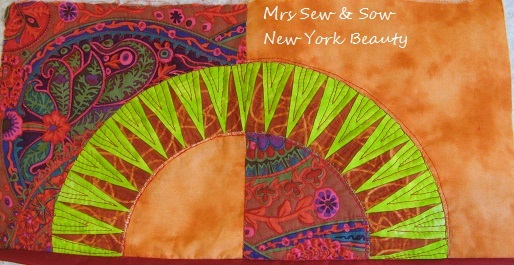 So it is angles juxtaposed with curves, graphic, bright colours and a textured feel. 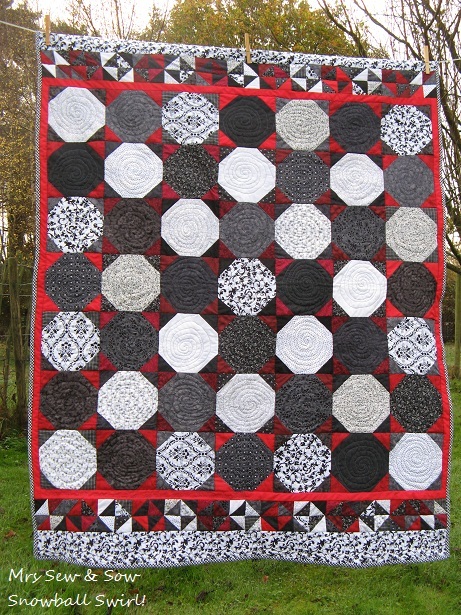 The quilting so far has suggested itself to be honest but I am thoroughly stumped by those blank bits....so far I have tried curves and a sort of trefoil shape but have unpicked both but maybe the answer is staring me in the face - do I need negative space here to counteract the busyness elsewhere? 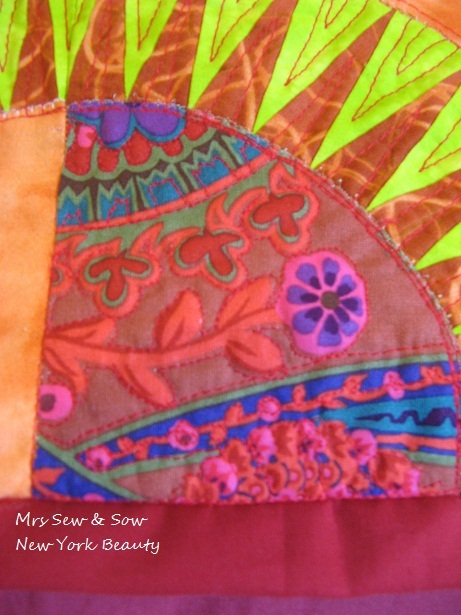 The back - I like to get my money's worth in whatever I do and seem drawn to decorate the back almost as much as the front on most things - be it quilt, cushion...whatever! Liking the look of this one from Leah Day called Wind Stitch but it is in the advanced category rather than the beginner section which I found testing enough! Ah well maybe I just need to practice! An awful lot! Is this the end of FMQ Friday as we know it? Yes it does seem that way much to my dismay but Cindy has done a sterling job for eight whole weeks in leading us by the hand and steering us onto better FMQ and she is also moving house, keeping a prodigal cat under close observation, and I am sure up to no end of other exciting stuff! So HUGE thanks to the gorgeous Cindy for all her hard work and enthusiasm. 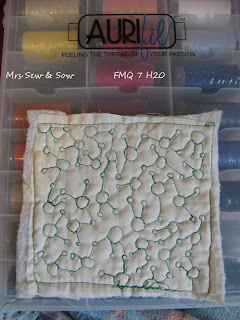 I am still wanting to carry on in the FMQ adventure so will try and keep up an FMQ Friday practice. Join me if you will! Have to say that like all good showmen it seems our Cindy has kept the best till last and so appropriate to have a star at the end for both the upcoming festivities and to express my feelings about Cindy - so here is this week's effort dedicated to Cindy for the superstar that you are! Needless to say I will also miss that merry and supportive crew of Friday-FMQers! 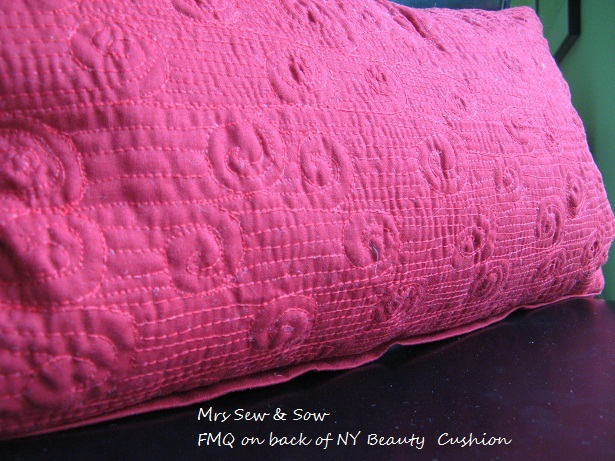 Stick around peeps and let me know if you have any more FMQ adventures to share. Yesterday I thought I would be doing all sorts but not finishing this project! 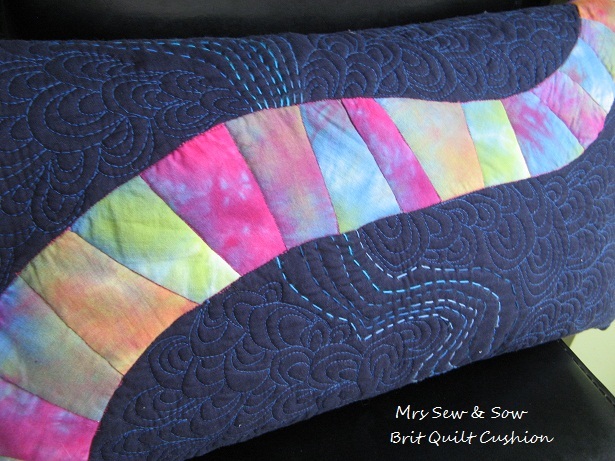 Obviously I have cushions on the brain....blame that Brit Quilt swap! And on this side I have added some hand stitching to the centre of the spider web block with cotton perle in lime green, peach, bright green, yellow, pink, grey and violet - quite a rainbow of colours! 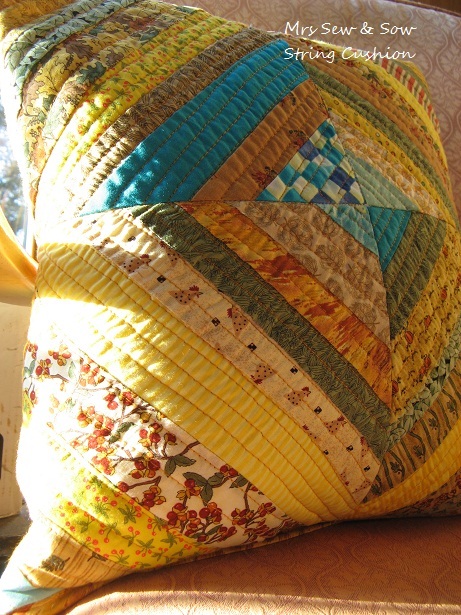 I like how the centre unquilted area sort of pouffes out in contrast to the quilted area. 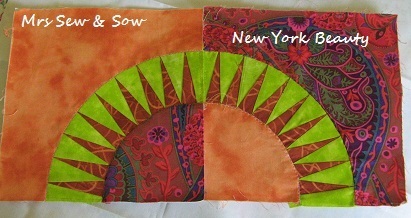 It is the same size as the one I sent to my Brit Quilt partner - though obviously in much brighter colours! Note the concealed zip! Have not tried to do one of these before but all I did was add a flap to cover the zip when I stitched it in - don't know if there is any other method but I am sure you will let me know. Well at first it was not so well concealed as I could not seem to get it to lie flat but it has improved with a bit of pressing! Note to self - check which will be the front of your cushion and make sure the flap opens to the back rather than what you want to call the front - didn't do that and would rather it was the other way round but not so bothered that I want to unpick it! 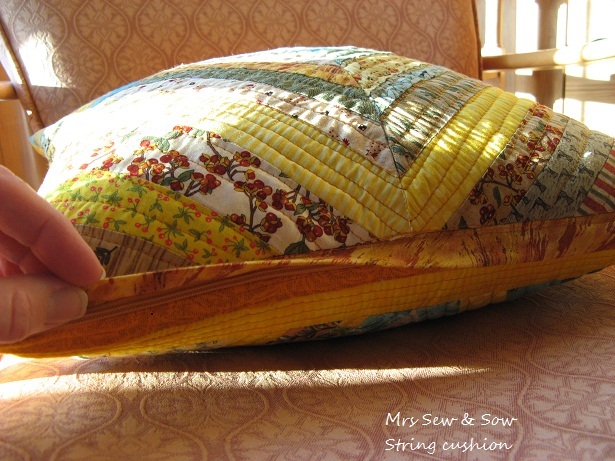 I finished my partner's cushion off with binding and it was fully lined inside but because of the zip at the bottom of this cushion I could not use that method so it is just seamed inside and no lining..... at the moment. 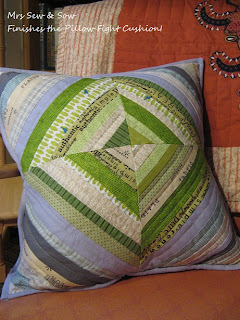 And this is another cushion that has come to me by way of Hobby Lass who blogs here and the Brit Quilt Swap. She also sent me a large bar of chocolate and two fat quarters to play with! Sorry but most all of the chocolate seems to have disappeared....mmmm wonder where that has gone? 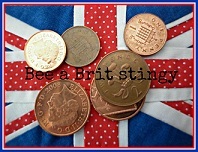 Still to hear from my Brit Quilt swap partner...!? Tomorrow I hope..but if not Monday surely! 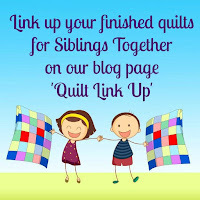 Linking up to Crazy Mom Quilts Finish it up Friday! as I finished a project started way back in 2009 - call it a maturing process....! 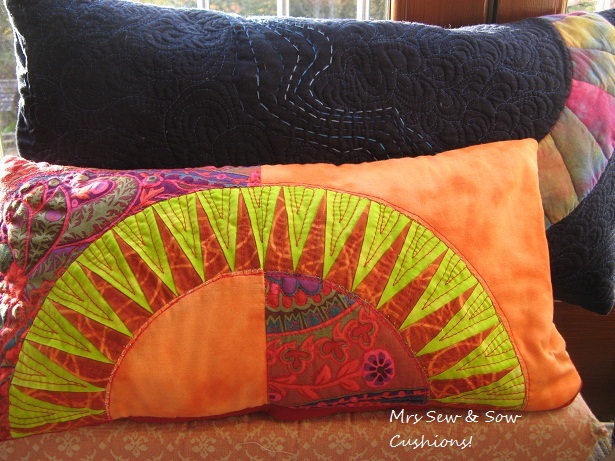 Back to Quilts and Aurifil! 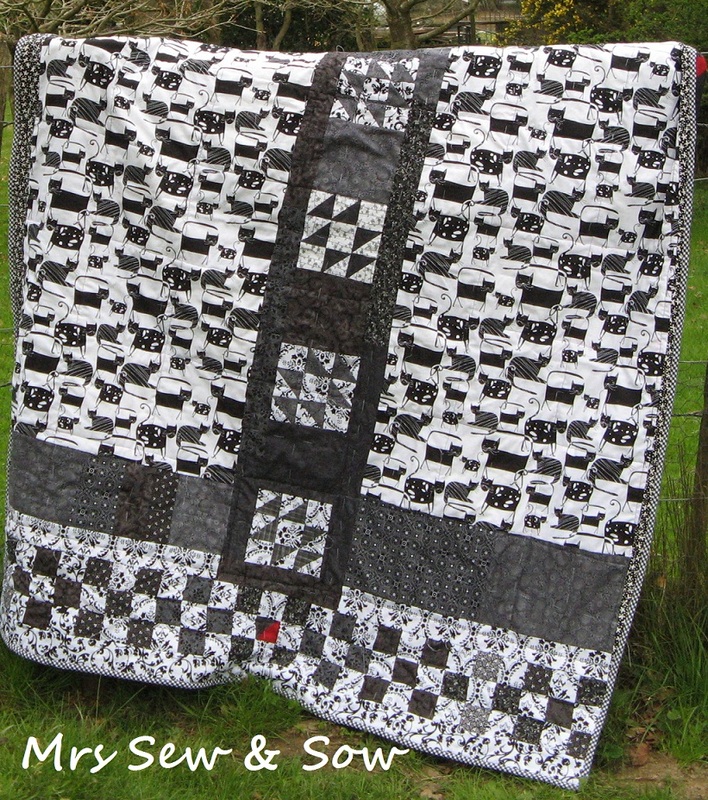 I love this piece of fabric I found with cats on the back but didn't have enough so split it in two, added some orphan blocks I had made and used up some scraps! 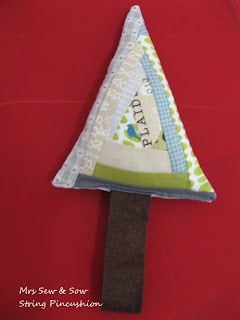 Oh and included one small half square triangle in red on the back - I love that! 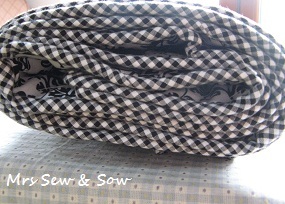 And a checkered binding cut on the bias! But really I was wanting to either do a snowflake or spiral in the centre of each snowball block but when I finished it off my machine quilting was not up to it! Though I had managed to stitch in the ditch or almost! Having practiced and played with FMQ and stitched most days of late I took a big deep breath and launched myself into this quilt yesterday and finished it off! Ta da! Complete with spirals in and spirals out again! This was one of the last swirls....quite a bit better! And yes I did mean to reverse the direction - every alternate one! Quite pleased with this - oh yes I know there are many wobbles and sharp points etc but what are those between friends. 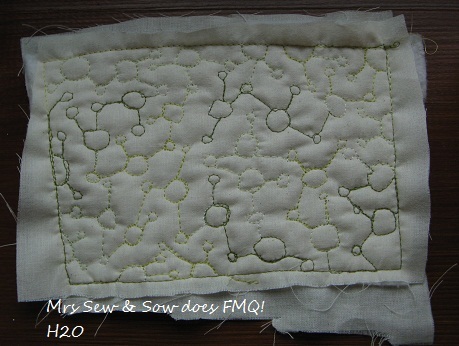 This was a chance to practice FMQ on a bigger scale and I am pleased I got to the end. 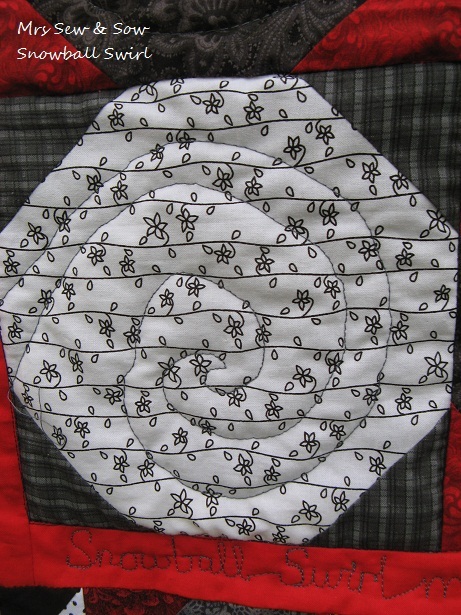 I also did smaller spirals in the border but think my label is my piece de resistance! 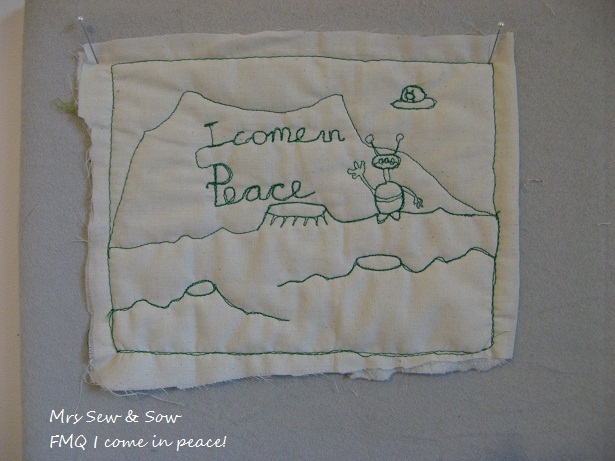 I FMQed it straight on the quilt - no penciling in first of all - though I did a practice on paper how I would join up the words. Love doing a label like this - high risk I know but the more I do it the better I will get! 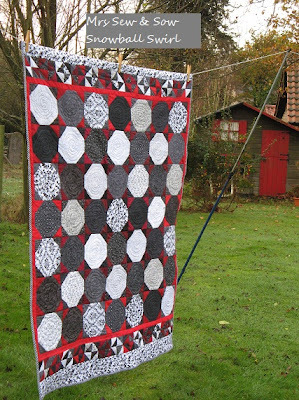 It cannot be easily separated from the quilt so hopefully quite secure as well though probably not permitted in a competition. Don't think I need to worry about that though as none of my quilts are competition standard. 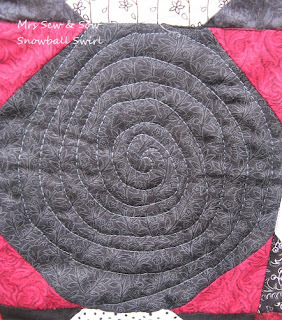 I have called it Snowball Swirl - cannot easily change that either! For the technical geeks among you I used some more of my lovely Aurifil thread 28 weight and this time in a steel grey colour 1158 - have to say I had no tension problems whatsoever - it was a breeze and makes a nicely defined stitch. In the label - perhaps the biggest test - it is easy to read. Previously when writing with the machine I have had to go over the writing several times to make it easily legible but with this thicker thread it was not necessary! I did speed up so the stitches are smaller because that makes the curves curvier I think and the writing more fluid. 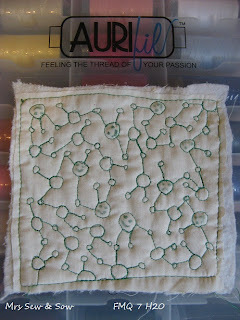 Love that Aurifil and am really enjoying playing with it (Big thanks again to Lynne!). 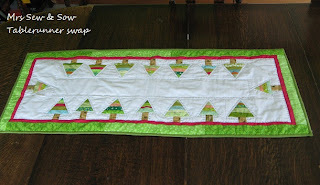 Next I think I will have to test it on raw edge applique...ooh what fun! 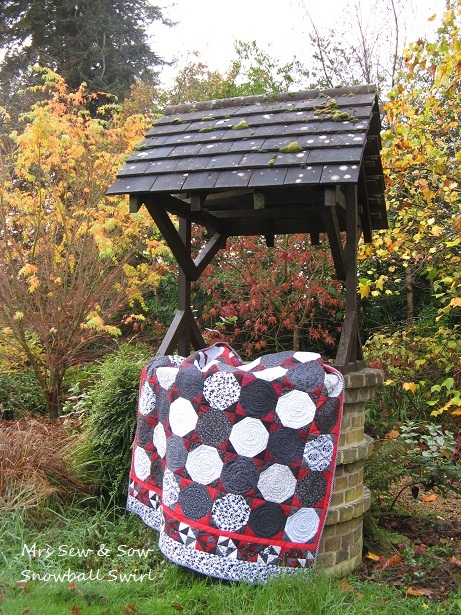 .....now where and what is the next quilt??? 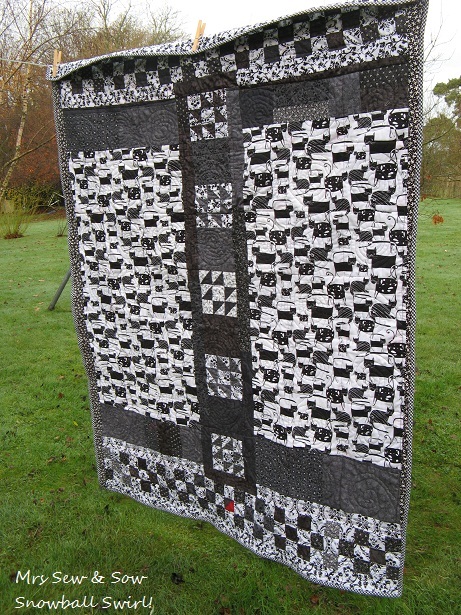 I think a baby quilt is calling me or actually some overdue blocks for Bee Blessed! Been waiting a little while for these. I am ecstatic! Look at those lovely colours! My local fabric shop is ok and pricey by comparison for the odd zip in dull and dingy colours but these make zips look cool and flamboyant! Who wants a hidden zip when you have these .. Especially when accompanied by this! 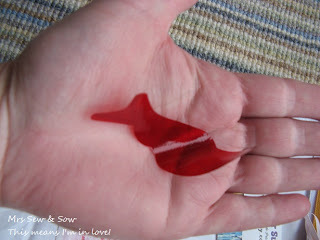 The fortune telling fish - used to get these in my Christmas cracker! Apparently I am in love .....yeah with those zips! And then when it turned over it meant I was false - not so sure about that one but hey who believes a fortune telling fish anyway! Nice bit of nostalgia though and quite glad to see they are still around. So I have jumped on this bandwagon gladly in pursuit of great zips at great prices and fully intend to make a little flurry of pouches. Just need to find a great contrasting fabric or two! 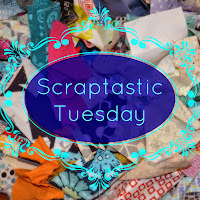 I may even have some in my stash though some beautiful scraps and linen are absolutely begging to be used for pouchy perfection! 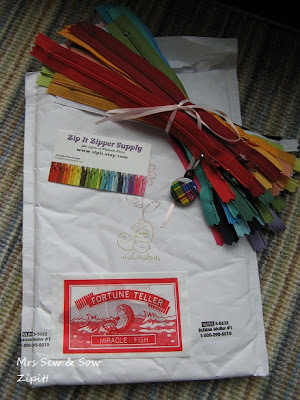 If you want to join in - I bought these 25 bright 8" zips from Etsy shop Zipit for $15.25 including shipping (£9.83) ! Did I ever think I would get around to catching up with little green men again?? 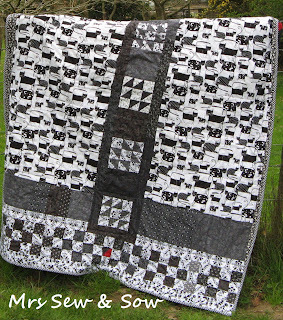 But here I am on what is supposed to be FMQ Friday but has slipped into FMQ Tuesday! Why? Because I was having a mad panic dash to finish my swap obligations amidst sick children and a hubby returning from a week in Japan and quite frankly something had to give ! So apologies to all those diligent FMQers and here are my efforts! For last week! But today I will conquer those little aliens - otherwise known as H2O! And yes I am flaunting my Aurifil win because I used my precious green Aurifil 28 in the making of these samples. Don't know if it is the thicker thread this time but it does look better! Oh and yes I have felt tipped in a few cheeky faces - couldn't help it! I am sure I wasn't the only person channelling Toy Story's little green men doing this one! As you know all little green men have four digits, three eyes, two antennae and a partridge in a pear tree - oops that is a different song! 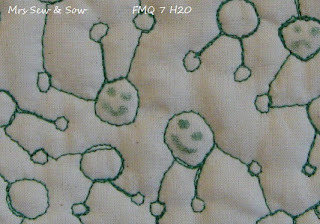 Having fun with FMQ? - oh yes! And now I'm off to join the party if I am not too late already! 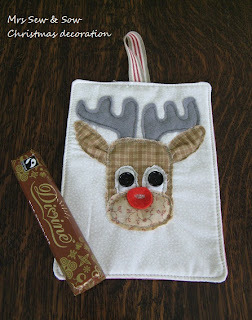 Last word on the swaps! Well it will be until I receive mine - I promise! I have managed to meet my deadlines! I am such a happy and relieved person! I think I went a bit swap mad and would rather stick to one swap at a time in future - feel free to remind me if I stray from this path of sanity..! I am hoping my partner will like it but should know soon as it stays in the UK of course and was sent 1st class - must say the postage was quite a lot as I sent the inner feather pillow but wanted it to be seen at it's best when opened and not lie around until an inner was bought to fit! It is quite a size and I was finding it difficult to find paper big enough to wrap it in! So lots of different colours of tissue paper went into the wrapping of it, two recycled layers of plastic and a final wrapping of brown paper! It should arrive safely and remind my partner of Pass the Parcel though she will need to provide the music....la, la, la! One might have been the back but I decided to offer two front instead! ....ooh and a bit of Fairtrade chocolate thrown in! Which runner is being packaged up you ask? Both! As I have a plan for the one not going to my swap partner! Which is going to whom?? Sorry I want to keep you in suspenders just a bit longer so you will just have to wait and see! The back or the alternative!? Now you can really see me! FMQ Friday - Needles, Water and Lightbulbs! Oops what happened to Tuesday!? Coming home to wonderful post! Stomach lining - looks nicer than it sounds!